I keep tabs on nail art trends, but I tend to be slow to jump on the band wagon. Like caviar bead manis. They're cute and easy, I even bought a few of the MUA Constellations. I had good intentions but kept putting off using them and then forgot about them. Well, until Avon Sprinkle Nails found me. I decided it was time to finally give them a try. Read on! 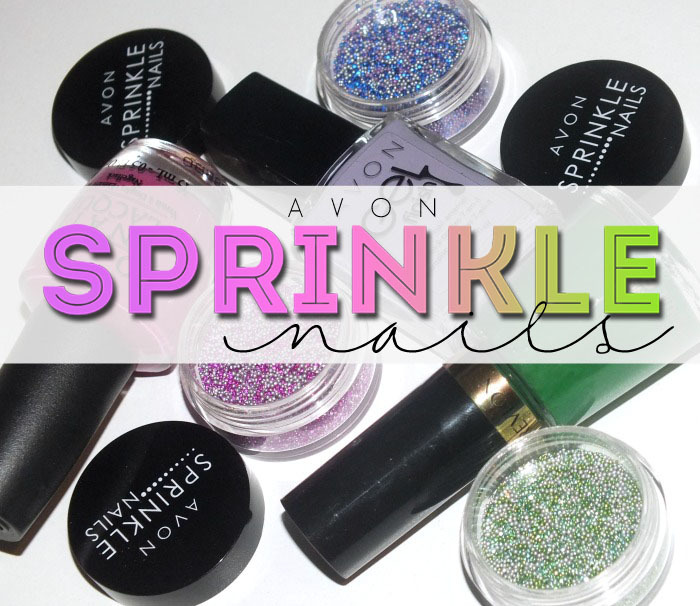 Avon Sprinkle Nails come in three colour blends housed in little plastic pots. The pot packaging makes it easy to just dip your nail in as opposed to other caviar kits that have you pouring the beads and then having to try and put them back into a bottle. Pink Confetti is a blend of translucent pale pink and fuchsia and opaque silver beads. Shown over OPI Dim Sum Plum. Green Confetti is made up of opaque lime green and silver beads and transparent emerald beads. Shown over Revlon Posh. Overall, I really like these! While they're not something I'd wear all the time, they are fun for a little bit of a change every now and then. They don't last too long- mine only wore for about a day- but still. Are you a fan of this look? What's your favourite type of fast and easy nail art?